As oppression and the stifling of civil liberties bring out stronger dissent from the people, so will emerge the witticisms of the youth. This young woman is quick to jump on the ‘Crazy Rich Asians’ craze. Photo by Mel Matthew. 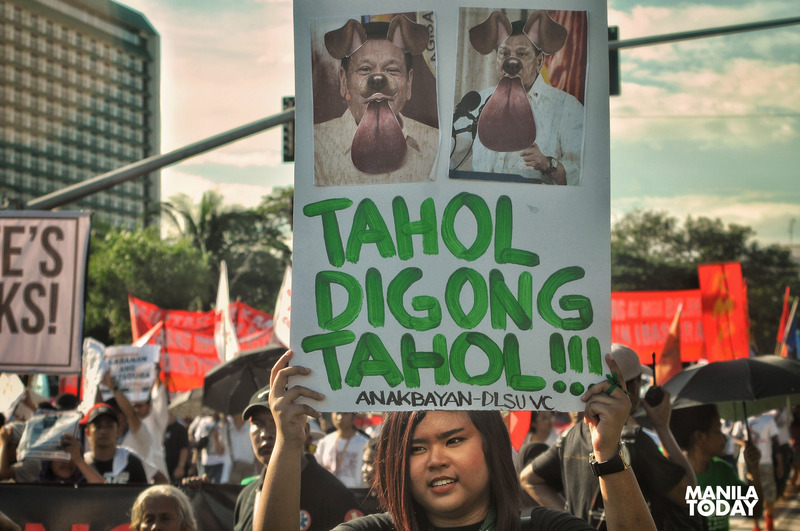 A member of Anakbayan De La Salle University manages to borrow quotations from the more recent ‘Goyo’. Photo by Mel Matthew. As in fighting tyranny then and now, ‘Charot’ never gets old. Photo by Jamela Santiago. Students and faculty of St. Scholastica’s College carried the motto of ‘Ora at Laban’ — pray and fight — a play on words from the school’s ‘Ora et Labora’. Photo by Mel Matthew. We may move on from old flames, but from the brutal martial law regime? Never. Photo by Jamela Santiago. While justice still awaits the victims of Marcos’ martial law, another Duterte-backed Marcos pursues the presidency. Photo by Engrid Genova. Speechless? Try an angry reax. Photo by Engrid Genova. A thumbs down will do, too. Photo by Engrid Genova. If millennials who were still babies or who weren’t born yet disapprove Marcos’ martial law, they definitely do not want Duterte’s tyranny. Photo by Mel Matthew. An artist group engaged the crowd in a game of tumbang preso. Only the faces on the cans make you want to do more than just hurl rubber slippers at them. Photo by Mel Matthew. And of course, the protest’s centerpiece — Ugatlahi Artist Collective’s ‘Wall of Damnation’ — makes protest art witty and militant all at the same time. Photo by Mel Matthew.